Ultrasound involves the sending of high frequency sound waves through the body by a device called a transducer placed on the skin surface. A lubricating gel is applied to the body to ease movement of the transducer over the skin and allow the sound waves to pass through the skin. The sound waves are reflected off the internal organs and the returning echoes recorded by the transducer to create an image of the internal anatomy. The ultrasound image is viewed in real-time. This means that both the structure and movement of the internal organs can be seen at the time of the examination, and the Radiologist will be able to discuss the findings with you once the scan is complete. Ultrasound does not involve ionising radiation (as in X-rays) and can be safely used to image pregnant women. Ultrasound is particularly useful for imaging the organs of the abdomen and is usually one of the first tests to be done for abdominal pain. Ultrasound is good for assessing the liver and pancreas, identifying gallstones in the gallbladder, kidney stones and lumps, and can show fluid collections or abscesses within the abdomen. Aortic aneurysms (abnormal dilatation of the major abdominal artery) are easily detected and measured. 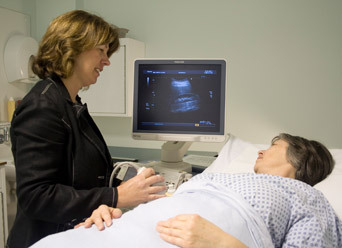 Doppler ultrasound is a special ultrasound technique used to detect and quantify blood flow in arteries and veins. Ultrasound is the preferred first line for imaging the pelvis and the investigation of gynaecological problems. This type of scan often requires an internal (transvaginal) scan using a special probe to give more detailed images of the womb and ovaries. Ultrasound using high frequency sound waves produces very fine detail of small superficial structures such as the thyroid, salivary glands, lymph nodes and lumps in the skin and the testicles. The nature of lumps can be ascertained and the structure of these organs examined to exclude small tumours. It is also used to examine joints, tendons and ligaments looking for strains or tears and associated problems. Ultrasound images are captured in real-time and therefore it is a useful modality to guide minor procedures such as biopsies, aspirations and injections into joints.